Have a free weekend and want to do something exciting? Well I have the itinerary for you! Horseshoe Bend and Antelope Canyon are located in northern Arizona, right on the border of Utah. These two wonders are so close to each other so if you are there for at least 48 hours, this itinerary is 100% doable! I actually HATE myself for waiting 21 years to see Horseshoe Bend and Antelope Canyon considering they are only a short 4 hour drive away from Las Vegas! I’ve driven to California, what, 20 times?! If you live even remotely close to these two beautiful sites… in the wise words of Nike, Just do it. On this trip I traveled with my two favorite ladies: My sister Brie & cousin Sofie – Girls Trip!! When to go to Page, AZ? We went in February and to be honest… I would not recommend! Even though it’s in Arizona and for some reason I always think Arizona is hot… it’s in Northern Arizona! It was very cold and windy (which can be pretty terrifying if you are standing at the edge of a cliff, ha!). I would wait a few months and go in the late spring / early summer times. We went at sunset and it was beautiful! I’ve read sunrise is equally as beautiful especially because you practically get the canyon to yourself. If you are feeling extra adventurous, you could see it again on the morning of Day 2 so you can experience sunset and sunrise! Comment below and let me know what time you think is better. For lower antelope canyon you must have a tour guide + reservation! There’s only a few tour companies to use, but we used Ken’s Tours. This tour company had the most options on length, type of tour and hours offered. They have the option for a longer “Photography Tour,” which in all honestly, not necessary! The canyon has so many turns that even when it is packed with tourists, you can still get plenty of pictures without someone in the background. I would only recommend this tour if you have some seriously high-tech camera equipment that takes you a while to get your shot! The drive from Las Vegas to Page is about 4 1/2 hours so we decided to stop in Flagstaff to see the adorable little ski town. This town was so picturesque with snow-capped mountains in the distance and local restaurants and shops throughout the town. (Where ever you end up coming from, as long as you reach Page before sunset, this itinerary will still work perfectly). When you arrive in Page, check into the hotel, grabbed some snacks and a bottle of wine from a local store and headed over to Horseshoe Bend. 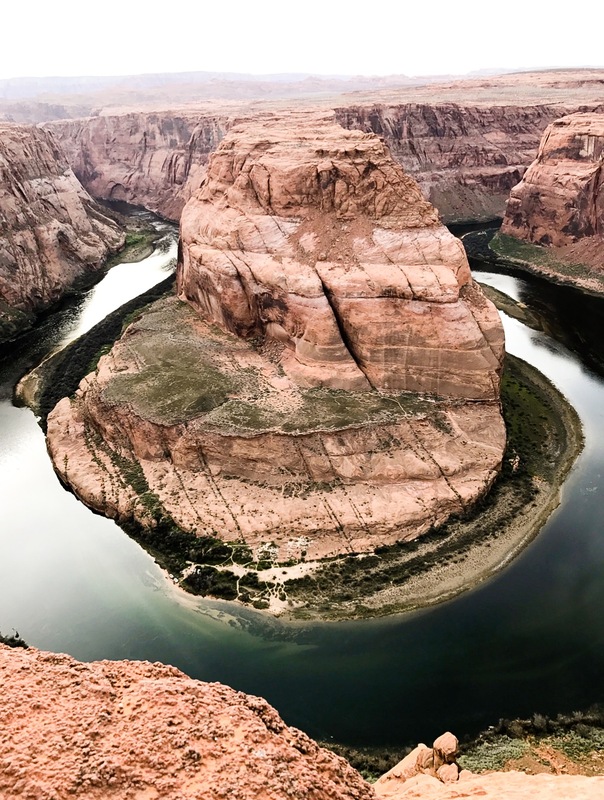 Horseshoe Bend is a section of the Colorado River that has carved its way into a canyon in the shape of.. you guessed it, a Horseshoe! The pictures do not do this place justice almost to the point where I didn’t want to show anyone! Anytime someone asks me what this canyon looks like, I just encourage them to see it for themselves. I could have sat on the ledge of this cliff and stared out into this canyon for ever. It is massive! End the night getting margaritas at the only Mexican restaurant in that tiny town – El Tapatio! I did a lot of reading on the difference between the upper and lower canyon. We only had a few hours so unfortunately could not do both, so I decided on the lower canyon. My decision was based on the fact that many travel websites said it was far less crowded… HA, Not sure if that is 100% accurate! It will be very very crowded and they will be shuffling people through, rushing you on your pictures.. still worth it though. Crowds are always such a bummer but then again, the place you are seeing must be truly wonderful if people from all over the world are coming to see it! Antelope canyon was one of those sites, it was breathtaking! You’ll access the canyon by climbing down a staircase and if you are on a tour, your tour guide will show you the most picturesque spots! The whole tour through and through is about 1 hour and costs around $40 – which includes the Navajo Park fee and tax. Unfortunately you can not control the weather, but try your best to see this canyon on a sunny day so you can see the light beaming down! We went in February and it was still pretty cold! I would recommend going in the Spring or early summer for better / less windy weather. If you have an extra day to spare, see the grand canyon too! It’s only 2 /12 hours from Antelope Canyon. Such amazing photos! I must confess that I hadn’t heard of Antelope Canyon before I read your post, but I have now added it to my ‘Must Visit’ list – it looks breathtaking. Glad you liked my post, thanks for stopping by!